In Discorso, one of the last manuscripts written by Antonio Neri just before his death, he reveals several transmutation recipes. One describes turning iron into copper; it is instructive because it uses common materials that we can identify and because the chemistry is now well understood. "Take some iron sheets and lay them in vitriol water, being immersed in that, they will rust. Scrape off this rust, which will be a red powder, melt it in a crucible, and you will have perfect copper. The same effect can be had from various waters that are naturally vitriolated, because they flow through mines of vitriol, such as those of a source some distance from Leiden, and another below the fortress of Smolnik, [now in Slovakia]. 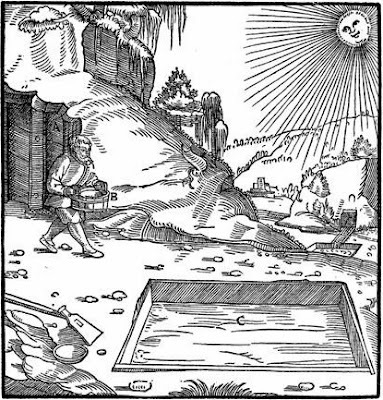 "Some estimate and not without reason, that this experiment, being used to prove the transmutation of metals, is not suitable for this purpose. They say that the vitriolated waters become such because they are already heavy with the corrosive spirits of sulfur, having passed through the copper or iron mine, these waters corrode copper in the same way aqua fortis corrodes silver. So that really the substance of the copper remains in the water, which attacks the surface of the iron, which always remains iron. However, if that were true then the iron would not get consumed, or if it were consumed it would mix with the substance of the corroded copper in the water, and if it were fused, it would remain a mixture of iron and copper. And yet in this experiment, all the iron is consumed; it is reduced by the vitriolated water into powder, […] which in the fusion is still pure copper, so there should remain no doubt that this is a true transmutation.